More than a dozen wildfires have attacked Northern California over the past week, killing at least 40 and destroying thousands of homes and businesses, including some of the country's most beloved wineries. 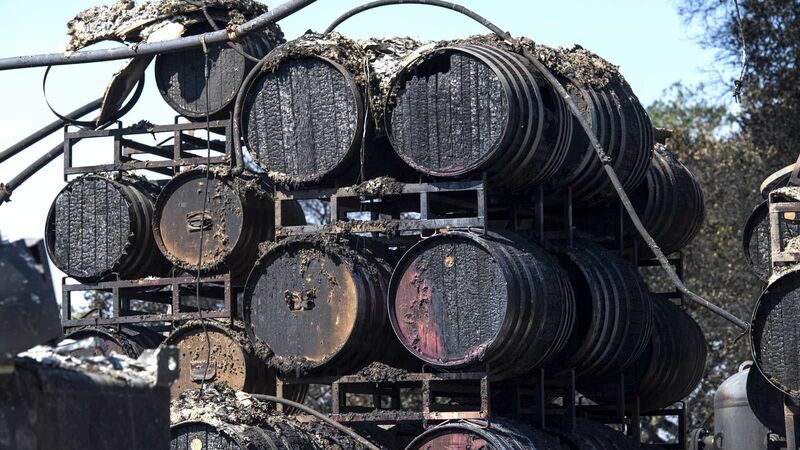 Napa's Signorello Estate and White Rock Vineyards, established in 1870, are among a long list of area vineyards that have reportedly experienced major damage. While there’s no replacing what was lost, emergency service workers and the devastated community are fighting back. On Sunday, the high winds started to slow down, allowing firefighters to gain ground and contain some of the fires. Of the tens of thousands of people who had to evacuate, the Associated Press reports some have begun to return to their homes, and local business owners and employees say hope is on the horizon. Meanwhile, Andrew Cates, owner of Segassia Vineyard, expects everything to be destroyed — but according to a spokesperson, the damage isn’t getting them down: "They plan to take the grapes from wineries that can no longer be used and turn them into Wine RayZyns, a new superfood fruit snack. Part of product sales for the month of October will go towards the Napa fire relief efforts." The owners of Sonoma County’s Ancient Oak Cellars still haven’t been able to return to their vineyard. The family winery's house and barns were destroyed, according to owner Melissa Moholt-Siebert, but all may not be lost. "We believe our vineyards have been spared, but we haven’t been allowed back on the property yet, though we have seen it from a distance and in aerial photography,” she said. Given the optimism and willingness of these local businesses to work together, it's clear that however long it takes, Northern California will make a comeback.